Iconic landmark development comprising 509 residential units where comprehensive range of choice units to choose from and to be one step nearer to your dream home! One of Singapore’s most sought after residential area, the heart of Bishan Central! Excellent accessibility to Transportation Hub! Retail & entertainment amenities Just within your proximity! 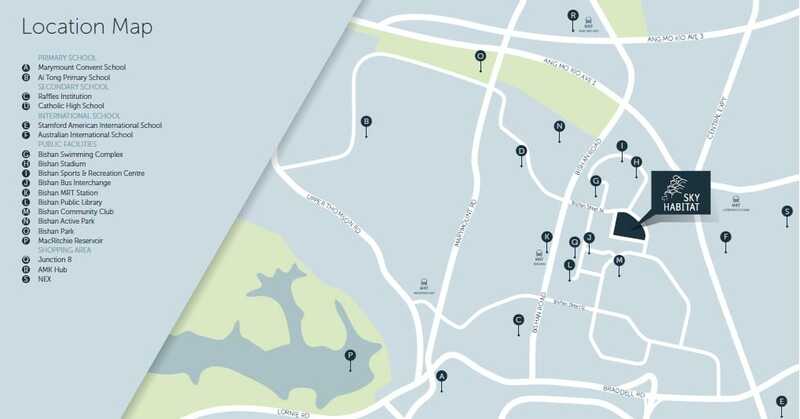 Orchard Shopping Belt, Marina Bay Sands, CBD are just a short drive away. Reputable schools within reach for your kids! A three-dimensional matrix of homes, private terraces and public gardens. Two independent towers linked by three bridging “sky gardens”. 70% of the site area being developed into a series of lush gardens, outdoor events rooms, swimming pools and walk paths. Offers opportunities for commonly shared garden and leisure spaces. Enjoy breathtaking views of lush greenery of Bishan Park. The structure is highly rationalized, affording cross-ventilation and multiple exposures to every unit. Allows air to breeze through and sunlight to penetrate. Maximizing views for the units as well as from the community spaces. Interior layouts and living spaces highly livable to meet homebuyers’ needs. Please contact me @ 8399 7983 or via below for more information on ​Sky Habitat. Schools that is within 1 km from Sky Habitat.